Click on the File menu and choose the option Exclusions. Then, on the right side, select the appropriate e-mail and select it by clicking once on it. Then on the left side, select the item Delete exclusion. 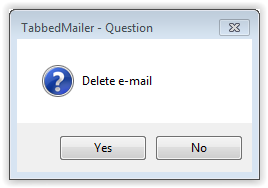 The program will ask if you really want to delete the banned e-mail. Click on the Yes button.